On October 31st, we had the honor of welcoming the EU Head of Cross-border Healthcare and Tobacco Control, DG SANTE, Thea Emmerling, to the Research Lab and Institute of Public health of the American College of Greece in Plaka. Her organized visit also included a trip to the American College of Greece campus in Aghia Paraskevi, where students and faculty were able to engage with Mrs. Emmerling and Professor Behrakis about tobacco control and in specific, smoking ban laws in schools in Greece. 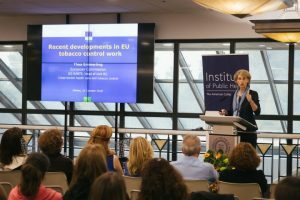 During her visit to the College, she shared with us current EU Tobacco control policies and actions, including the Tobacco Products Directive (TPD), a directive created to facilitate the functioning of the internal market on tobacco and related products, as well as the Joint Action for Tobacco Control (JATC), a project to facilitate the implementation of the 2014 TPD, in which the Hellenic Cancer Society is leading organization. Professor Behrakis reported that the results of the Hellenic Statistical Authority Health Interview 2009 and 2014 Survey, a very reliable study of the Greek population, have shown a decrease in smoking prevalence from 32% in 2009 to 27.3% in 2014. He explained that this decrease is expected to decrease further as young people in recent years in Greece are choosing not to smoke. 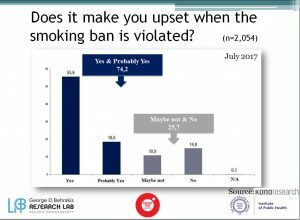 In regards to the smoking in ban in Greece, according to a survey conducted by Kaparesearch in 2017, 75% of the Greek population stated they were upset the ban is not enforced in public places. Smoking in schools or on school grounds is a violation of Article 17 of Greek Law 3868/2010 which outlines the “protection of minors from the use of tobacco products”. The smoking ban in schools includes all spaces located on the property including “uncovered areas such as roofs, terraces, balconies or any other outdoor or semi-open spaces etc” and apply to everyone; staff, faculty, students and visitors.